Directions: This stop has nothing to do with the Battle of Pilot Knob, but since you're here, why not? 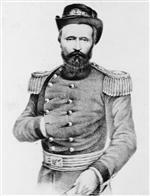 Ulysses S. Grant started out his Civil War career in the State of Missouri. 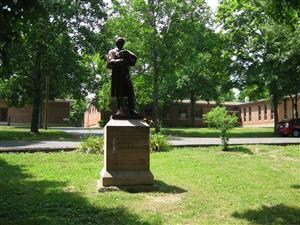 The Ulysses S. Grant Monument [ Waypoint = N37 35.739 W90 37.714 ] is located on the grounds of the Ste. Marie Du Lac Church at 350 S. Main Street, Ironton, MO 63650. You will want to turn around and head back south down the Russellville Road. When you get back to State Highway 72, turn right (west) to head back towards Arcadia. After about 0.6 miles, you will get to the Stop sign where 72 Highway connects into Pine Street. Turn left (west) onto Pine Street and continue one block to Main Street. Turn right (north) onto Main Street and continue about 0.25 miles to the entrance to the Ste. Marie Du Lac Church. Turn left through the gate entrance onto the church grounds. There should be a small duck pond on your right. Try not to run over any of the ducks or geese :-). Follow the driveway around to the right and, after a short drive, you should see the statue on your right between the driveway and the pond. "Shortly after my promotion I was ordered to Ironton, Missouri, to command a district in that part of the State, and took the 21st Illinois, my old regiment, with me. Several other regiments were ordered to the same destination about the same time. Ironton is on the Iron Mountain railroad, about seventy miles south of St. Louis, and situated among hills rising almost to the dignity of mountains." "I arrived here yesterday. Since that time I have studied the nature of the ground it may become necessary for me to defend, the character of the troops, and the means to do it with. From all that I have yet learned, from spies and loyally disposed citizens, I am led to believe there is no force within 30 miles of us that entertains the least idea of attacking this position, unless it should be left so weak as to invite an attack. It is fortunate, too, for many of the officers seem to have so little command over their men, and military duty seems to be done so loosely, that I fear at present that our resistance would be in inverse ratio to the number of troops to resist with." Grant would spent little time in Ironton, being ordered to Cape Girardeau by the end of August and to Cairo, Illinois soon thereafter.